This electric Pressure Cooker Beef Curry with Coriander/Cilantro sauce is not your average curry. 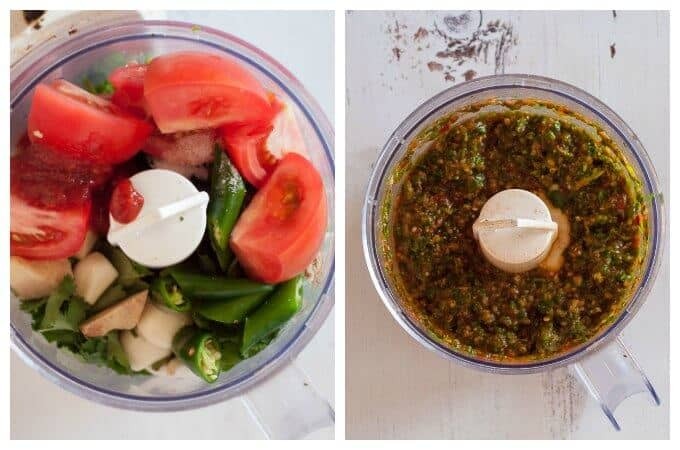 There is nothing from a jar – its completely made from scratch and has a flavour base of garlic, ginger, tomato, coriander/cilantro, basil and coconut cream. 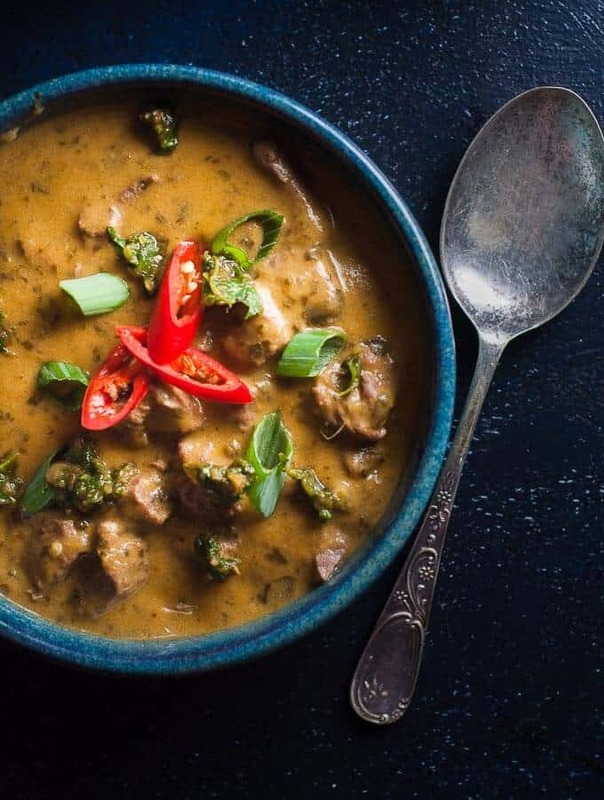 It’s a one pot, 30 minute curry with thick creamy sauce and chunks of juicy tender beef. 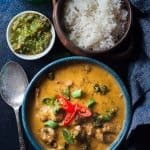 This curry uses a very generous amount of coriander/cilantro and basil which is one of the things that makes this curry so unique and different from others you may and made or tasted. It’s also a suer handy recipe if you keep a kitchen garden and have an abundance of these herbs you need to use up. The use of herbs are the major flavour contributor in this recipe is also one of the reasons it is a very light curry. There’s no oily residue, either on top or on the bottom of the pot. 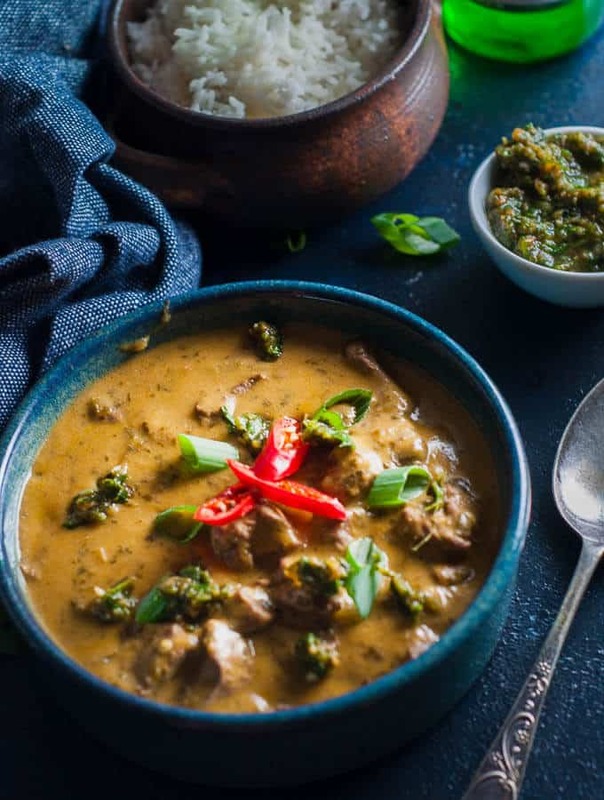 This is a clean and green beef curry that is delicious on its own, or with rice and some additional greens, like little mini broccoli florets, green beans or peas. I recently learnt that there seems to be two camps when it comes to Coriander as we call it in Australia. Those who love it and those you hate it. I even found out there is a Facebook Group called “I Hate Corriander”, and even some of my friends are anti-coriander. But I on the other hand am a coriander lover. Always have been. I grow it, I eat it (sprinkled on salads, pastas, strifries) and I cook with it. Coriander has so much going for it in terms of health benefits. It’s full of antioxidents and is packed with iron, fibre and magnesium. And it has lots of Vitamin C (which is good for your immune system) and Vitamin K (which is great for bones). I couldn’t rave on about coriander without giving the humble Basil a plug as well. I am an equal fan of this herb and it also grows in abundance in my kitchen garden. 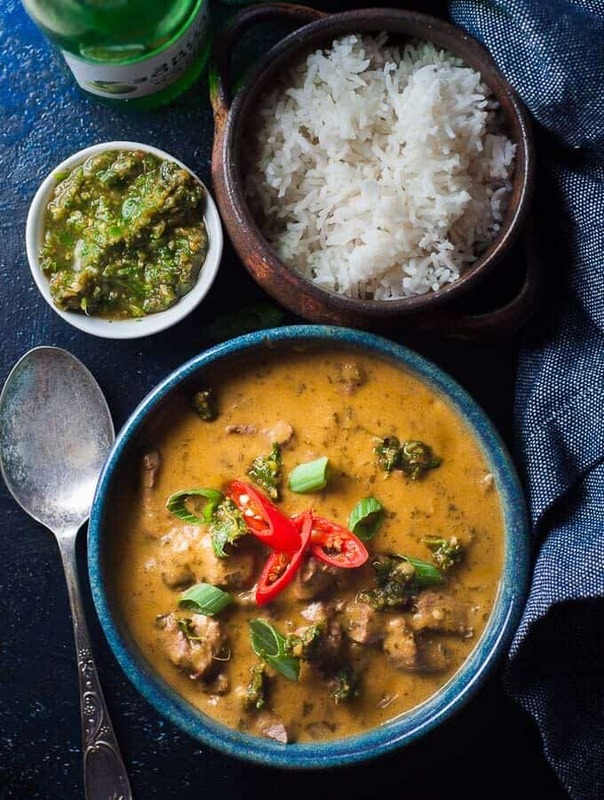 The combination of the two herbs in this recipe works really well providing a fresh, light and earthy twist to the good old Beef Curry, which can sometimes be known for being heavy and oily. This curry will fill you up and leave you satisfied without weighting you down and it will keep in the fridge for 3 days. Great if you make it on a Sunday night, which means you have the next few nights dinner sorted. It also freezes well too. Portion it out into freezer friendly containers for even more weeknight convenience. Who needs TV Dinners from the supermarket when you can make your own instead? Not I.
Chop off the roots of the coriander before putting into the blender/food processor for a smoother paste. Coriander roots are often included is Asian recipes, but in this curry it is not necessary as you want to avoid that citrus flavour that the roots and stems provide. Remove the stems of the basil before putting into the blender/food processor so you get a smoother paste. Taste the paste and add more salt and pepper if needed. Because there is so much herbage in this recipe, it needs a generous amount of seasoning. The amounts I have included are perfect for my palate, but you might need more or less depending on your tastes. If you don’t have lean been, trim the fat before you brown off. This recipe works best when the meat is lean with no big noticeable fatty bits. Plus, I don’t like eating these bits, which is why I buy lean meat. BONUS TIP: When measuring out the coriander and basil, make sure to pack it into the cup firmly. This recipe needs generous amounts of these herbs to make the flavour POP. 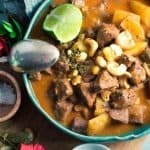 Other Pressure Cooker Recipes—>>>> Pressure Chicken Stew with Rosemary and Pearl Barley, Pressure Cooker Chicken Korma Curry, Pressure Cooker Mexican Beef Taco Bowls, Pressure Cooker Beef Massaman Curry, and Pressure Cooker Chicken Cacciatore. 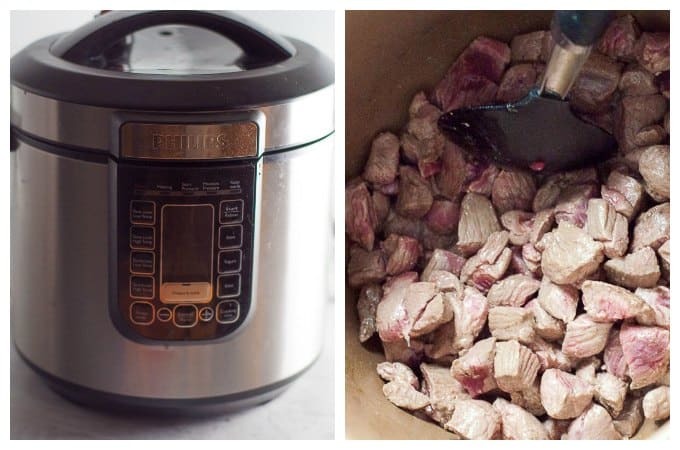 I use my trusty Phillips Electric Pressure Cooker to make all my pressure cooker recipes and I love it. The meat turns out perfect every time, there is hardly anything to clean up afterwards and I get “slow cooked” dinners, in “pressure cooker” time. If you’re over standard and boring Beef Curry dishes, give this one a go. 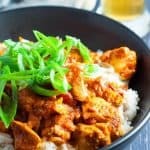 It will surprise and delight you with how easy it is to create a curry that is deliciously unique yet so familiar you’ll want to eat it again and again. This electric Pressure Cooker Beef Curry with Coriander/Cilantro sauce is not your average curry. There is nothing from a jar – its completely made from scratch and has a flavour base of garlic, ginger, tomato, coriander/cilantro, basil and coconut cream. 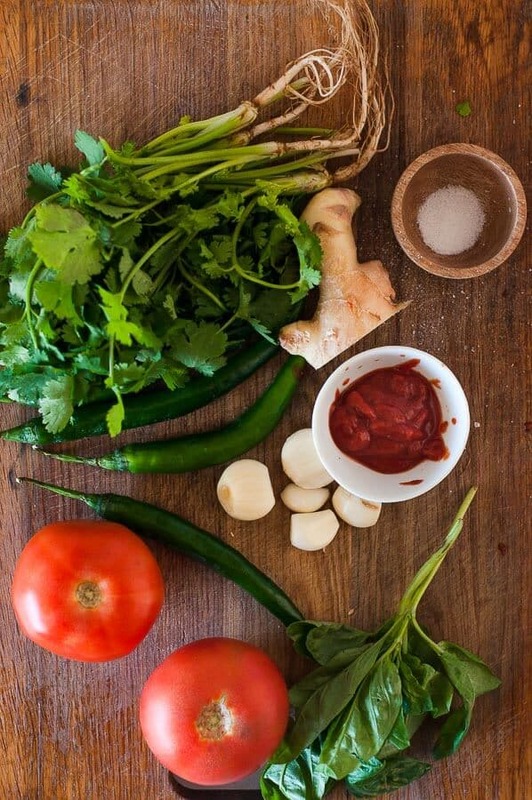 In a food processor or high speed blender, add the chilli, ginger, garlic, tomatoes, tomato paste, coriander/cilantro, basil, salt and pepper. Blitz to combine until is resembles a smooth paste. Take out enough paste to fill ¼ of a cup and put in the fridge for serving. Hold the remaining paste to the side. Add the vegetable oil to the inner pot of the pressure cooker. Do not use the lid while sautéing the meat. Keep the lid to the side. Add the coconut cream and peanut butter to the pot. Stir to mix in. Remove lid and stir the curry. To thicken, make a cornflour slurry by adding the cornflour and water in a small cup, stirring to combine. Stir the cornflour slurry into the curry and stir to thicken. 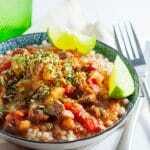 This curry freezes well and will keep in air tight containers in the freezer for 6 weeks. If keeping leftovers in the fridge, eat with 3 days.